The Maltese summer fever has touched down, so we feel that it's the right time to share our main event of the season. 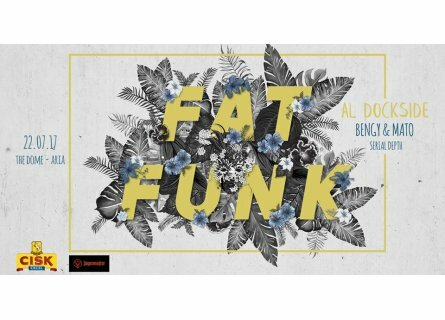 The movement that is fatFunk is back with a right cracker. When we first set out, we promised to keep things real and moving in to our 4th year we are sticking to the plan. Our chosen artist for this event is not your average big name, but an unsung champ who in turn, has the big names longing for his collection of records. fatFunk warmly welcomes Al Dockside, a DJ/Producer who kickstarted ear training early on thanks to his fathers vast record collection. He's been exposed to the real stuff from day 1 and still holds some of the best records known to Dj's. Add a stellar catalogue of producers on his label 'Dockside Records' which has been running for 6 years and you know this man screams quality. Humble in his approach but in your face with the music we are particularly excited about seeing your reaction to his selection. For this year we have a whole team who will be taking care of the concept & decor for this special evening being held at DOME area in Aria. All this is possible thanks to our favorite sponsors Cisk and Jaegermeister.